If you enjoy watching hummingbirds, its easy to plant flowers that will bring them, and keep them, around your garden. I have a number of deck pots full of plants specifically for hummingbirds, including various colors of salvia and petunias, all in a range of hummingbird favorite colors of red, pink and white, and purple. Hummingbirds like flowers from pink to purple with red being a favorite. 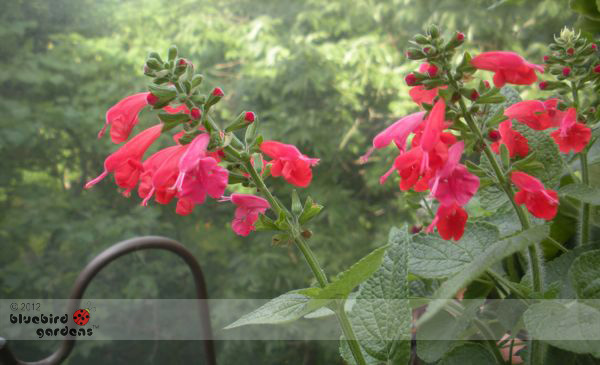 Don't these red salvia look like tiny hummers? Hummingbirds are also very fond of single-blossom tropical hibiscus, which are native to hummingbirds summer grounds in Brazil. Since hummingbirds use their long tongues to lick, single blossoms are easier for them to access nectar. There are also a number of Missouri wildflowers that I've personally seen attract hummingbirds, including bee balm, columbine, purple coneflower and, I hear, indian paintbrush, something I have yet to successfully grow from seed but I'm still trying. Hummingbirds also enjoy coral bells, fuchsia, honeysuckle, russian sage and phlox. I keep pots on my decks with some of their favorite flowers so I can enjoy them when they visit! A Hummer of a Moth!